Wednesday announced Rs 26.54 billion defamation lawsuit against Imran Khan. “I have never been indulged in any sort of corruption during my chief ministership and completed mega public welfare projects in a transparent manner,” he added. Chief Minister said Khan had made groundless and fabricated allegations against him, saying that they did not grant the contract to Javed Sadiq rather it was the Q League government that gave the IT Tower contract to him. “I know Javed Sadiq since 2008 and if Imran’s allegations held ground, the alleged culprit should have had development contracts by the government. Sadiq made the bid through a company but he was not given a contract,” he clarified. The Chief Minister said he would resign if Imran Khan provided proofs of spending Rs 35 billion on the project. Imran Khan could not bring the proofs but the prime minister presented himself for accountability on Panama Leaks issue, he maintained. The Chief Minister announced to quit politics and walk away along with his children if court decided in Imran Khan’s favour. He also requested the court to hear the case on daily basis for early verdict. “I want this defamation suit should meet its logical conclusion. 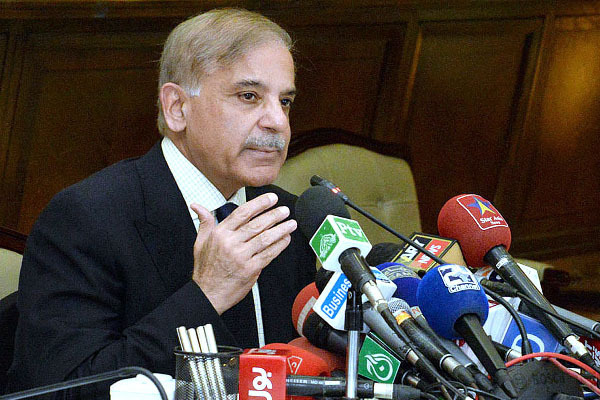 Pakistanis will never forgive politics of lies,” said Shehbaz Sharif. in court but he was going to court first against him. “Let it be decided once and forever,” he said. Without mentioning the name, he accused that the person who got his loans waved off became one of the richest men overnight. Shehbaz Sharif said anti Pakistan elements endorsing sit ins did not desire progress of the country and timely completion of development projects. “Those who don’t want Pakistan to prosper, have conspired to seize Pakistan on November 2 while opposing the CPEC.” He hoped that politically sane people would once again reject their wicked plan to cripple country’s economy. The Chief Minister vowed to expose Imran’s nefarious designs come what may. He said neither history, nor the nation would forgive him (Imran) for disrupting national progress through his agitational politics. “What will they (PTI) lose by opposing CPEC? He is Brown Sahib, but the people will be the ultimate sufferers,” he maintained. The Chief Minister said PTI leaders were creating confusion and lying to the nation to make sit in in Islamabad a success, however, he said the attempts would be fizzled out. He alleged parties that talked about taking part in Islamabad protest could not see Pakistan flourishing. Refuting PTI Chairman’s claim that the Ittefaq Foundry girders were used in Metro Bus, he made it crystal clear that Ittefaq Foundry had been shut for the last 15 years. Provincial Law Minister Rana Sanaullah Khan and Spokesman Punjab government Syed Zaeem Hussain Qadri accompanied the Chief Minister Punjab.